In Shinto, the Inari is a fox: spirit of harvests, fertility, rice, agriculture, industry and worldly success. In Robamimi's latest escape-the-room game Inarin, your own success depends on both finding and deciphering the clues to solve puzzles, and following the implied directives toward enlightenment—of the escaping kind that is. Like all Robamimi escapes, Inarin is played by pointing and clicking, taking a cue from the changing cursor as to what areas are interactive or not. What isn't already intuitive is well-explained within the interface and any time you get lost, needing a nudge toward your next goal, the HINT button will dish out just a small bit of information to help you decide where to go next. For the most part, everything is superbly logical and those hints aren't needed as long you carefully observe the environment, working out the solutions as presented. Yet those not familiar with Japanese lettering might struggle a bit because the letters on a certain puzzle are not an exact replicate of those in the clue. In that case, you can either experiment a bit with the possibilities or just look to HINT for a more approximate representation. Albeit, style wins out over substance, and Robamimi's beautiful, photorealistic fantasy setting makes for an enchanting escape break. EDIT: the author has revised this game to make it more accessible to English speakers. When you begin, you're facing a set of double-doors flanked by two fox statues. Note the height of the designs on each of the six ribbons. Count the inter-connected circles on the left statue's pedestal and compare to the ones on the right statue's pedestal. Fire burns hot and bright in the braziers. In this view, you can look up to see the top of the torii and the ceiling open to the night sky. Look up and observe the Hiragana letters on the torii's placard. there are two hollows where you might place something round. move the bigger dish aside to note the design on the mat and count six smaller dishes circling the design. Under this table is a box. It needs a 3-character code to be opened. Examine the top of the stump to find a GROUND STONE.Take it. A stick bell hangs above the offering plate, a handbell rests on the little table, and an image of a torii is painted on the wall. The loops pattern on the front of the box and the six switches on top should remind you of something else. Click on each switch to adjust the position of the buttons. Position each button to the proper height. When you have adjusted the switches correctly, press the "OK" button. Get a CANDLE from inside the box. Turn to face the doors and two fox statues. The order in which you click on each statue is shown in the number of interconnected circles on the statues' pedestals...One circle means first, two connected circles means two, three is third, and so on. When done correctly, the doors automatically open. 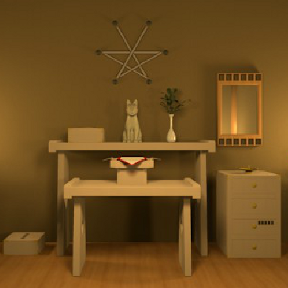 Straight ahead, when you first enter room two, you'll see an altar area with another fox figurine on it. Take the SAKAKI PLANT out of the vase. Note the four pie-slice buttons and the way they look when one is pressed down. Make note of how the ribbons are connected to each stone. Notice how, when you click on the four buttons, the patterns change. Light the candle on the nearby brazier. Place the LIT CANDLE in the sconce. 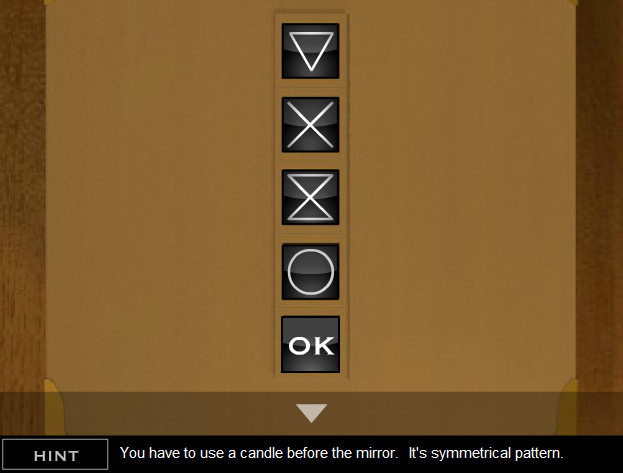 Make note of the pattern shown on the mirror. In the top drawer, you'll find a PICTURE (dark). Take it. The second drawer has another picture; remember the information shown on it. The third drawer is locked: a 4-digit number is needed. The bottom drawer is empty. Notice that each of the two doors has a different Shinto letter written on it. There's also a round hollow area on each door where something can be placed. There's an empty bowl resting on the top tier. On the bottom tier is another puzzle where you need to place six fish tokens. Face the first wall of room two and zoom in on the box on the floor, to the left of the fox altar area. Change the design on each of the four buttons to open this box. Just mirror the left side of the designs to get a whole design. After entering the correct designs, click the "OK" button and the box will open. Get the FIRE STONE from inside the box. After completing the Four X's Box and looking on the tree stump, you'll have two stones in your position: GROUND and FIRE. Put the GROUND STONE in the left door and the FIRE STONE in the right door then click the doors to open them. It's dark inside this closet. Put the FISH PICTURE inside the darkness to see what is revealed; six Shinto letters. Using the clues from the picture in the dark room, place each fish token on the correct six hiragana letters. The tokens must be placed in the proper order. Because it's hard to match up these characters to those on the dark picture, use the "HINT" button here. It'll only tell you what you already should know, the proper six characters, but they'll be easier to read and match to those on the board. EDIT: the puzzle has been revised to use Arabic lettering... just follow the clue from the dark picture for the token placement. When all the tokens are put in their proper places at the proper time on the board, water will magically fill the bowl above. Place the SAKAKI PLANT on the stump. Then use your bowl of WATER on it. Watch the magic begin to happen. The patterns inside the bowl should look familiar to you. Using the clues on the drawer itself and inside the empty water bowl, make out the 4 numbers needed to unlock this drawer. Click "OK" when you have inputted the correct 4-digit number and the drawer will open. Get the WATER stone from inside the drawer. Click on the base of the tree to begin climbing it. Keep clicking the top arrow until you've reached the top of the tree. Take the SHINING SKY STONE out of the sky. After getting the sky stone, see how it glows. Go back into room two and open the double doors to the dark closet (if you need to, replace the ground and fire stones to unlock the doors). Use the SHINING SKY STONE in the dark closet and you'll see a fan. Examine the fan up-close and note the information you find on it. Use the information from the second drawer and the fan you saw in the dark room to unlock this box. Note: the solution works only after you've closely looked at the fan handle. When the buttons are pressed in the correct sequence, the box will open. At this point, you should have five stones, including wind and water. Just as shown on the torii's arch, place the correct two stones into the round hollows on the pillar: WIND STONE on top and WATER STONE on the lower position. The placard has raised up, so back up and then look closely at the top of the torii arch for another clue. Using the clue from the arch, click either the bell stick or handbell in the correct sequence. Stick, handbell, stick, handbell, stick, stick, handbell, stick, handbell, stick. When done correctly, magic happens. Look inside the offering basket and get the SOUND STONE. Examine the other side of the sound stone and you'll see three more Hiragana letters. 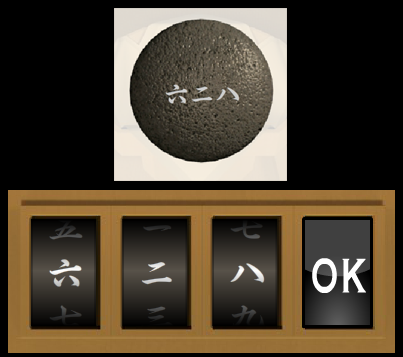 Click each of the three buttons to change them to the correct three hiragana characters. Edit: enter the number as shown on the back of the sound stone. When you've entered the correct letters, click "OK" to open the box. 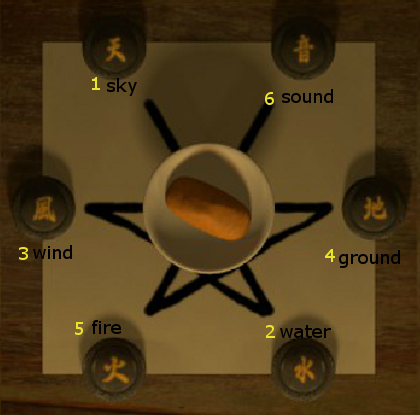 Get the SKY WATER WIND GROUND FIRE SOUND scroll from the box. If you haven't already, go around both rooms and reclaim all six stones from where you left them. Going in order, starting at SKY and ending with SOUND, place each of the stones in the correct dish. To figure out which stone goes where, and when, use the clues from the woven design above the fox figurine as well as the scroll found in the 3-character box. When done properly, an INARI SUSHI piece will appear on the plate. Pick it up. Take the INARI SUSHI, go into the second room, and set the sushi in the offering basket in front of the white fox figurine. Watch as the magic happens—you have "escaped"! Before you go, click the screen to step back and get a better perspective on where you are. The character-based clue was indeed tough, I needed the hint. Otherwise, everything was quite intuitive. Ugh, this really needed to translate the puzzles too. I gave up on the second Japanese character puzzle (the box that needs three characters). I'm stuck on the 6 figures you have to place on the game board. I know what clue to make use of, but the characters on the board are different enough from the ones in the clue I can't find the right combination. It is like they were written by 2 different people so have different handwriting styles. Yes, it is. My best advice here is to use the HINT button so you can see the letters more clearly. Also, you need to place them on the board in the correct order. I've posted a walkthrough and it has more details in the "Fish Tokens Puzzle" spoiler. I hope it helps! Now I'm stuck on the 3-Japanese character puzzle/clue. the little bell made sound like the jingle bells. I thought the little bell was just a red herring. Oh well, I'm giving up. Seems this escape's puzzles are too rooted in the Japanese language for me to understand. Thanks for the previous help, Elle. I finished it, the walkthrough gets you most of the way. Look at the pattern above the fox statue. It shows an order of placement, start at the upper left. You also have an order of stone placement on the parchment. When the stones are in the right order in the dishes that match the design above the fox, then inari appears in the big center bowl. The parchment that is still in the drawers tells you what to do with it. Huh, it looks like a few concessions to English speakers have been made since I looked at this a few hours ago. That's good. This is the best escape game I've played in a while. I don't see how the Japanese language should be a problem, the hints are in English and the symbols have translations next to them. You don't need to be able to read Japanese. A question: why you guys start putting the stone from the upper left but not from the upper right corner? It starts from the upper left because that is where the ribbon starts, you can see it runs from there to the bottom right underneath. Game must be glitched, I placed all the stones and nothing happened? @elle Thanks for the walkthrough. 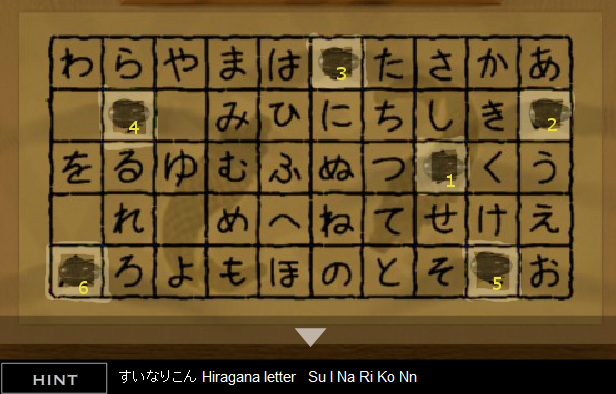 It looks like for the "3 Hiragana Letters Box Solution" you don't need the letters anymore. He's changed the puzzle to simple numbers, which can be found behind the SOUND stone. For all of you complaining about the Japanese language -- you DO NOT NEED TO UNDERSTAND JAPANESE TO COMPLETE THE GAME. Be patient - everything you need to know is revealed in one form or another. At least this katakana table isn't as mind-grinding as the one in Bird's Eye View. @yaddab I was wondering the same thing--though I guess it makes sense if you think about how the pattern was placed on the wall--it works upwards fromt he first point, where the other 'obvious' solution, you're going 'downwards' in layers. There seems to be a problem using IE11. What is the fix, if any? Thanks. If it's possible to use another browser, I would recommend Chrome or Firefox. I personally have Chrome, Firefox and Safari on my various devices and I'm happy with each for different reasons although Chrome is my favorite for speed and reliability. Although it's reasonable to expect a browser game to work in any browser, there are enough variables in each that sometimes a game designer can't always bug fix for every browser out there. Most games will work in either Chrome or Firefox, though, if not both.